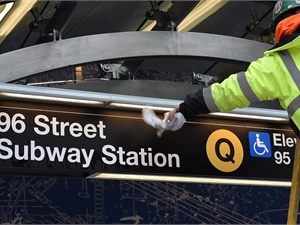 Features of the new 96th St. station for NYC's Second Avenue Subway, unveiled on Dec. 22, 2016, include access for the disabled, climate control to maximize customer comfort, modern computerized signage, and column-free construction for an open, airy atmosphere. The station spans three city blocks at 1,591 feet long and 57 feet wide, and was built with high-ceiling and column-free design to create an airy sense of openness. Its two-tiered mezzanine design is a fixture of the Second Avenue Subway stations and improves the flow of riders, reduces crowding on the platform and enhances the overall subway experience for riders.